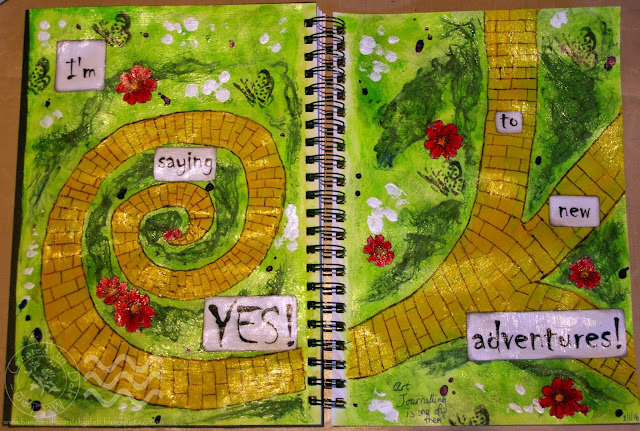 Handmade Cards by Deb: I'm saying YES! to new adventures! I came across the saying "I'm saying yes to new adventures" somewhere online on New Year's Day, and I thought it suited my fledgling art journalling career perfectly. This is all a new creative adventure for me and I'm excited to embrace it. When I thought of this saying, the beginnings of the Yellow Brick Road immediately came to mind. I can remember watching Dorothy in the ruby slippers beginning at the inner point of the road as it spiraled outwards. Eventually the road comes to a fork, and each path is a different and new adventure. Thus the inspiration for this spread. Thanks for stopping by! I hope everyone finds (or makes) the time to get a bit creative every day - it's good for the soul!